TERMINAL is a restaurant and bar with a unique atmosphere, in the heart of the bustling downtown, situated in what was once a bus station, together with the Design Terminal, where contemporary Hungarian and fusion cuisine await gastronomic adventurers. It is no secret that one of the goals of the menu selection in the TERMINAL restaurant was the perpetuation of the distinctive Bauhaus style of the exterior and interior design. A genuine culinary experience – delicious dishes with an unconventional presentation. The innovative kitchen keeps pace with gastronomic changes while still preserving the traditional character of the dishes. 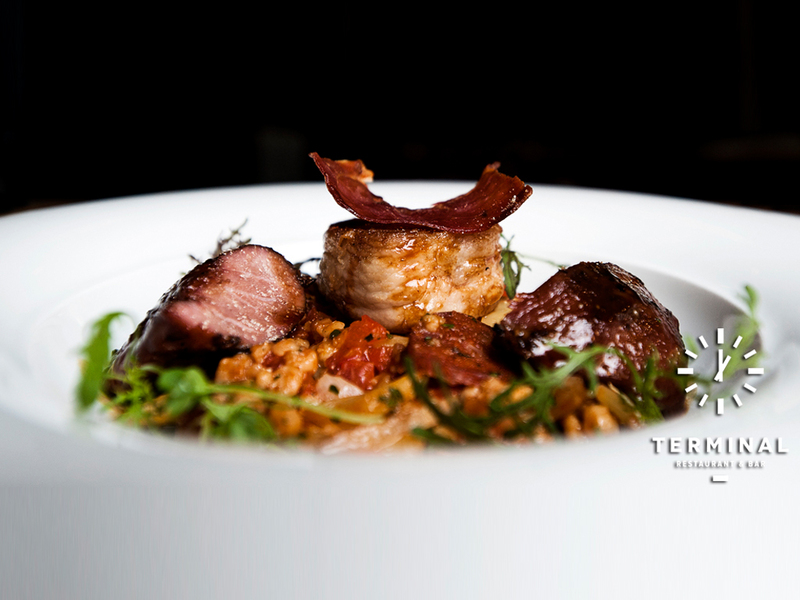 The high standard of TERMINAL is guaranteed by the brilliant chef Zsolt Serényi, associated with high-end gastronomy. The star chef and his team are constructing new food creations from dishes of the classic international and Hungarian cuisine. They cleverly combine the spices and typical ingredients of various geographical regions and, as a result, new, harmonious flavours and eye-catching food wonders are born. TERMINAL Restaurant & Bar is the first Hungarian restaurant to offer the widest possible range of authentic BBQ meals. Come and try this new dining experience. They work only with the highest quality, fresh ingredients selected with an expert eye. The aesthetically pleasing food and drink menu, as well as the wide selection of wines are continuously renewed. There is a new Chef’s Special every week, which is a good reason for visiting the restaurant every day. In the evenings TERMINAL’s large display of tasty cocktails, quality wines and ice-cold beers awaits customers at the bar. At the weekends live club concerts and star DJs offer unforgettable nighttime entertainment at the city’s most frequented square. The iconic Bauhaus building that houses the restaurant awaits guests all day with its large glass surfaces and terrace. The unique venue that seats over 120 people is easily accessible. It is a perfect choice for corporate events, business lunches and dinners, as well as conferences, receptions or weddings. Situated in the heart of Budapest’s business centre, surrounded by the most beautiful hotels and a large green park with fountains, Erzsébet square is a popular meeting point for all generations. Due to its central location and excellent features, this is the city’s most popular square, close to Fashion Street –frequented by visitors who love fashion and shopping, and the square is also home to the most popular professional skatepark in Budapest. Erzsébet square also boasts the Budapest Eye – a large ferris wheel with glass cabins that offer a fantastic view over this bustling city. A popular exhibition, design fair, conference and concert venue, a cultural centre of European standard and a great place to sit and relax with friends after a hard day or just read a book with a glass of wine.